FOX is definitely hosting the SuperBowl this year! It is evident in their commercials, of course, but also in this week's episodes of The Simpsons, Bob's Burgers, and a shot in American Dad. The biggest play, however, was definitely for the seaside town restauranteur, who decides to capitalize upon the huge audience of the event and drum up some business. It made for some funny burgers ("The Longest Chard" and "The Kale Mary") and a cute song, but it wasn't very substantial. 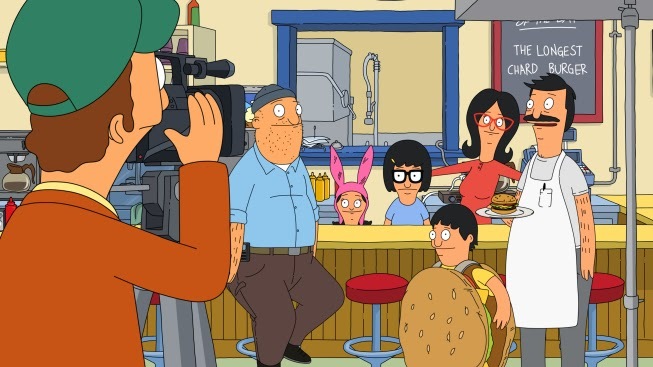 Because it is a peculiar "holiday" to depict, it will probably get a lot of replay action, but I'm looking forward to something different for the Belchers. Bob's Burgers "Easy Commercial, Easy Gommercial" (S04E11): When Jimmy Pesto is advertising to Superbowl watchers, Bob decides to do the same, starting a(nother) feud. Bob thinks that taking out a 15-second, $3,000 local commercial for the bi-county area will grow the business, and proceeds to empty his bank account to do it. [seems super cheap! though maybe the market is just that tiny there?] The family talks about commercial ideas, and decide on the slogan, "come meet our family, let us meet you," which gives Linda a chance to sing, and Louise a chance to write the script. [I kinda liked the saying at first, but it got old fast.] But, they only have four days, so Randy comes to direct and film the spot because he's cheap.